15 Best Fall Activities to do in Colorado! Find gorgeous views of changing foliage and experience the crisp, cool air in Colorado this autumn. Viewing the state's aspen trees in their yellow fall form is a good reason to spend some time outdoors. From hiking, to horseback riding to skiing, an experience with nature is a must in the Rockies. There is something for everyone to enjoy. Enjoy these 15 best fall activities in Colorado. Enjoy fall's beautiful scenery one step at a time. Colorado is known for incredible mountain views and pristine hiking trails. You can find a hiking or walking trail for any level here in the colorful state. 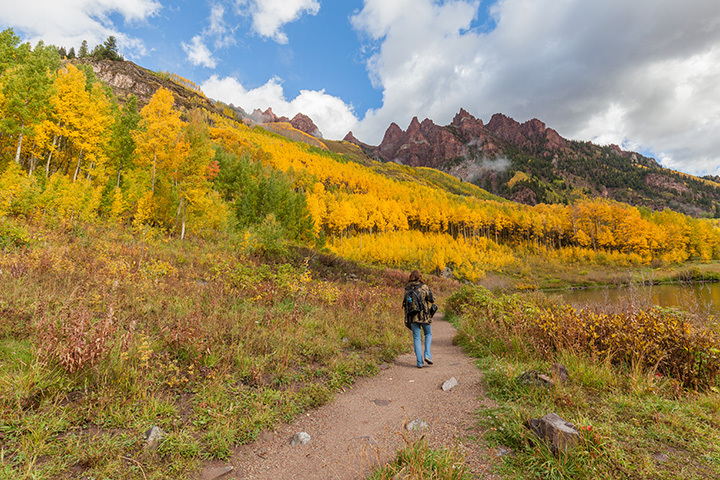 Look for trails lined with aspen trees, the tree that blazes yellow during the autumn season. There are so many trails in Colorado, but some of the most notable hikes during the fall are the Maroon Bells trail in Aspen-Snowmass and Alberta Falls in Rocky Mountain National Park. Celebrate the closing of summer and embrace the change into a new season by visiting a fall festival in Colorado. Various fall festivals occur across the state, typically featuring fall treats, festive beers and musical performances. Check out these popular festivals to experience a great autumn in Colorado: Mountain Harvest Festival, Fall Fest, Splendor in the Rockies, Applefest or Oktoberfest. With the trees changing and creating a blaze of color in the forest, autumn proves to be a gorgeous time in the Rockies. Colorado is home to some beautiful scenic drives, and a drive in autumn is something that shouldn't be missed. Venture into Rocky Mountain National Park and drive up Trail Ridge Road, or cruise down the San Juan Skyway. Colorado Highway 62 has epic views during the fall. And Colorado's oldest scenic byway Peak to Peak Scenic and Historic Byway has been awing visitors since 1918. Colorado's summer agricultural season starts to slow down and fall crops are ready to be harvested during the autumn months. With a variety of pumpkin patches across the state, it should be easy to find the perfect pumpkin here in Colorado. Popular pumpkin patches in Colorado not only have a pumpkin patch but also corn mazes and other forms of fall entertainment. Anderson Farms or Studts Pumpkin Patch are two notable farms that have kept Coloradans happy for years. Corn mazes are a popular pastime here in Colorado. The maze is made in a field of corn. It's a great way to spend some time outdoors before the snowy Colorado winter. There are a variety of corn mazes in the state, but Fritzler's Corn Maize and Diana's Pumpkin Patch Corn Maze have rave reviews. Colorado might be known for its mountains and snow, but the state is also home to a variety of incredible microbreweries. Fall is a great time to partake in specialty beers because breweries release their fall concoctions and beer festivals take place during the season. Attend the Great American Beer Festival in Denver or Fall Back Beer Fest in Estes Park. If you can't find the time to attend a festival, you can still just enjoy a fall brew. Check out New Belgium's Pumpkick or Avery's Rumpkin. During the fall season, wildlife in Colorado preps for winter, especially elk. One of the best places to spot elk is in Estes Park during autumn. Elk breed in the fall, and groups of cows and calves are typically found with one bull. The elk dominate the town during this season, so it is very likely to hear their bugling or see elk in town and in Rocky Mountain National Park. Estes Park even holds Elk Fest every fall. Late summer and fall are when farms gear up for the end of the season. Harvest during this time varies from summer's late blooms to fall's fresh squashes and root veggies. Many farms small and large will typically have a farm stand to visit and a tour of the farm. Learn how a real farm works in Colorado and enjoy the fruits of its labor. Although there are numerous farms in Colorado, Rock Creek Farm and Miller Farms are perfect destinations for a great fall day. Fall is truly the spookiest of all the seasons. Face your fears and find your fright by visiting a haunted house here in Colorado. The state features seasonal haunted houses, crafted for the perfect scare. Or get a more authentic experience by visiting some of the state's legendary haunted establishments, like the Stanley Hotel or Hotel Colorado. With the hot temperatures of summer gone, the autumn weather in Colorado is truly refreshing. Embrace the beautiful fall weather now before winter hits by taking an autumn bike ride. Coloradans love to bike, whether it be road biking or mountain biking. Visit Boulder or Fort Collins, two bike-friendly cities here in Colorado, to find bike rentals and bike shops. For Coloradans, autumn means that ski season will soon be upon us! Although the majority of ski resorts won't open until November and December, Loveland, Keystone and Arapahoe Basin Ski Areas open as early as October. So hit the slopes like a true Coloradan this autumn. The fall season in Colorado brings cool temperatures across the state. The best way to embrace the cooler weather is to experience it while soaking in a relaxing, natural hot spring. The state has numerous hot springs, however Strawberry Park Hot Springs in Steamboat Springs and Glenwood Springs Hot Springs in Glenwood Springs are two popular and relaxing hot spring destinations. Colorado is home to cowboy culture. Experience the fall scenery at a slower pace by riding a horse on some of Colorado's incredible backcountry trails. Find horseback riding opportunities through guided tour groups, ranches and some parks. Colorado has a variety of incredible restaurants. Restaurants with seasonal or rotating menus will make the switch from summer's fresh tastes to fall food classics. Check out Boulder's restaurant week during this autumn season. The beauty of fall truly lies in the changing of fall foliage. Experience Colorado's fall views in luxury by train this autumn season. Check out the Fall Colors Explorer train in southern Colorado where you can enjoy a full service bar and a fall-inspired meal.